ww2dbaseCheng Xueyu was born in Hangzhou, Zhejiang Province, Qing Dynasty China in 1899, into a prominent family. He attended Hongdo Middle School in Hangzhou in 1912, and then continued his studies at the private Xinyuan Middle School in Nanchang, Jiangxi Province. Between 1917 and 1919, he attended the Private Fudan University in Shanghai. Around this time, he adopted the new name of Tianfang (Wade-Giles: Tien-fong) and the courtesy name of Jiashi. When the May Fourth Movement broke out in 1919, he became active in politics. 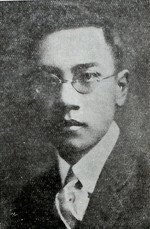 In the fall of 1919, he was elected president of the Shanghai Students' Union. In this role, he played a leadership role in the New Culture Movement that stemmed out of the May Fourth Movement; his efforts as a student activist also won him a meeting with Sun Yatsen. In late 1919, he traveled to the United States to continued his studies, with all expenses paid for by the Chinese Nationalist government. He initially studied philosophy at the University of Chicago in the state of Illinois, but he would eventually transfer to the University of Illinois in Urbana-Champaign, where he would obtain a master's degree in political science in 1922. Later in the same year, he enrolled in the University of Toronto in Ontario, Canada for further studies. In 1923, he joined the Chinese Nationalist Party. In 1926, he earned a doctorate degree in political science from the University of Toronto. He returned to China in Aug 1926. In late 1926, he was a lecturer at Private Fudan University and The Great China University, both of which were located in Shanghai. Around this time, he adopted the art name of Shaozhi. In Jan 1927, he was made a high party official of Jiangxi Province. In Feb 1927, he was made the head of the Jiangxi Provincial Department of Education and a key leader of the Nationalist AB Group, an anti-communist organization. 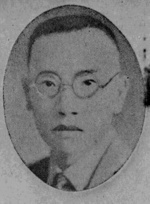 In Apr 1927, he was kidnapped by communists; nearly executed by the communists, Cheng was freed when, in May 1927, Jiangxi Province Chairman Zhu Peide decidedly allied with Nationalist leader Chiang Kaishek, positioning himself further way from the communists. In Dec 1927, he was made a professor of the National Central University in Nanjing, China and was made a member of the executive branch of the Republic of China government. In 1928, he was made the chief political instructor for officer candidates at the Republic of China Military Academy in Nanjing. In late 1928, he was made the head of the Anhui Provincial Department of Education. In Jan 1929, he was made the president of Anhui University. In Mar 1929, he was elected into the Central Executive Committee as an alternate. In Jun 1931, he was made the deputy at the Nationalist Party Department of Propaganda. In Dec 1931, he took on a concurrent role as the head of the Jiangxi Provincial Department of Education. In the fall of 1932, he took on yet another concurrent role as a committee member at the political section at the military high command headquarters. In Dec 1932, he was re-elected to the Central Executive Committee as an alternate. In Feb 1933, he was made the Hubei Provincial Department of Education. Later in the same year, he was made the President of Zhejiang University in Hangzhou, Zhejiang Province, China. In Sep 1934, he was named the Dean of National Chengchi University in Nanjing. In Nov 1934, he was made the Jiangsu Provincial Department of Education. ww2dbaseIn Jun 1935, Cheng was named the Chinese Ambassador to Germany, though he did not arrive in Berlin until Jan 1936. He was well respected among top Nazi German leadership, and in turn he grew to understand and admire fascism. He had written on the "highly organized ability" of fascism, and that certain fascist practices would do well in China in an attempt to centralize political power. He was twice an invited guest to the annual Nürnberg (English: Nuremberg) party rally. While in Germany, he was instrumental in maintaining a good Sino-German relationship even after the signing of the German-Japanese Anti-Comintern Pact. When Germany expressed displeasure in the Sino-Soviet Non-Aggression Pact of Aug 1937, it was Cheng who resassured German officials that the ruling Nationalist Party had no intention of adopting communism, and the pact was merely a matter of necessity while China engaged in full scale war against Japan. Through his efforts, Germany would continue to export armaments to China for some months to come. In Feb 1938, German leader Adolf Hitler officially recognized the Japanese puppet of Manchukuo in northeastern China and proclaimed his wish for a Japanese victory in the Sino-Japanese War. Very quickly, Cheng found himself useless, as German officially suddenly grew cold to him. He submitted his letter of resignation in Mar 1938. Later in the same month, German Foreign Ministry announced that no more Chinese students would be admitted to Germany military academies. In Apr 1938, Germany abruptly ended the sale of weapons to China. In May 1938, all Germany military advisors attached to the Chinese Army were recalled. On 30 May 1938, his resignation letter was accepted by the Nationalist government, and he was replaced by Deputy Foreign Minister Chen Jie. ww2dbaseIn 1939, Cheng was made the president of National Sichuan University in Chengdu, Sichuan Province, China. In Sep 1939, he was also made the head of the Youth League of the Three Principles of the People. In 1943, he returned to the National Chengchi University, though now relocated to the temporary war time capital of Chongqing, as its head of education; concurrently, he was also a standing committee member of the Defense Committee of the executive branch of the government. In 1945, his son Cheng Yuan accidentally drowned in Chongqing, China. In Sep 1945, he was the representative to the United Nations Educational, Scientific and Cultural Organization (UNESCO). In 1947, he was elected to the Jiangxi Province legislature. In 1949, he was made the chief of the Nationalist Party's propaganda organization. In 1949, he relocated to Taiwan as the Nationalists lost the Chinese Civil War. Between Mar 1950 and May 1954, he was made the Republic of China Minister of Education. Between 1954 and 1958, he was a research fellow at Washington University in the United States. Between 1958 and 1965, he was the Vice President of the Examination Yuan. During this time, he also served as a special adviser to the President of the Republic of China. In 1965, he became a member of the management committee of the National Palace Museum in Taipei, Taiwan. He passed away in New York, New York, United States in 1967. 30 May 1938 Chinese Ambassador to Germany Cheng Tianfang's resignation was accepted by the Chinese foreign ministry. 29 Nov 1967 Cheng Tianfang passed away in New York, New York, United States.